With stunning new design and layout and the most up-to-date travel information, the market's most indispensable phrasebook CD pack has been reinvented, and is better than ever. Gem Mandarin CD Pack will give you the right word at the right time -- every time In all of the most common travel situations, you need the reassurance that you can communicate with ease. 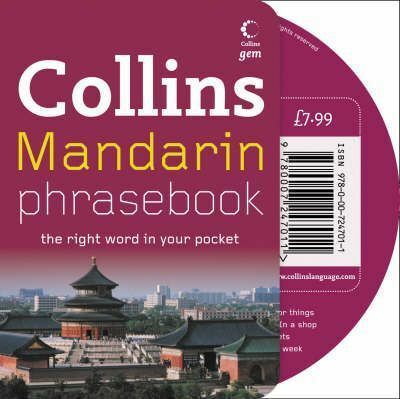 A reliable, portable and easy-to-use phrasebook is a travel essential, and now with the completely re-designed Collins Gem Mandarin CD Pack with an accompanying CD to help you hear and practise the language for real, the right word will always be at your fingertips. With a whole new look inside and out that includes a new cover and easy-to-navigate layout, it is now simpler than ever to use Mandarin effectively and with confidence. This indispensable multimedia language guide covers the topics and phrases that crop up everyday on holiday, from finding a hotel to choosing wine.